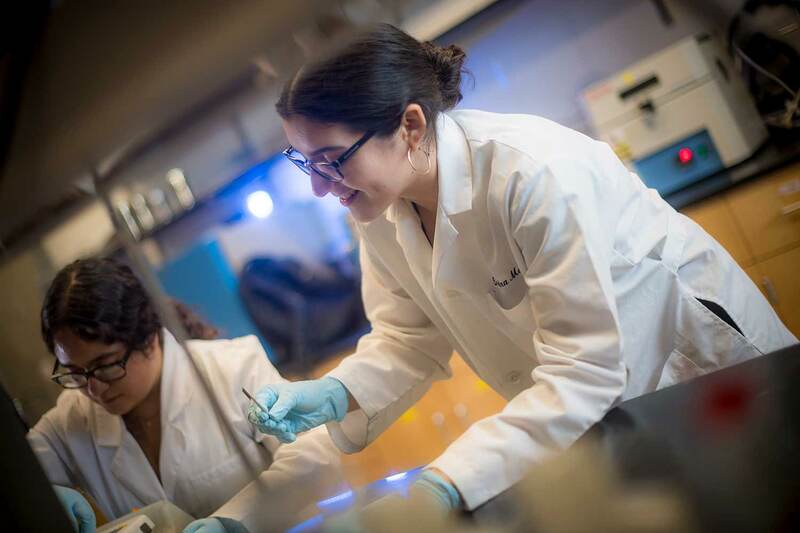 High school students Angela Mendez and Carolina Martinez spent seven weeks at UC San Diego working side by side in nanoengineering professor Zheng Chen’s lab developing a coating that could protect lithium-ion batteries from overheating and catching fire. They learned how batteries work; what it means to conduct research; what it’s like to be an engineer; and experienced life as a college student. While they were helping build batteries, they were also building bridges between the United States and Mexico: Mendez attends high school in San Diego, while Martinez is a student in Tijuana. They were two of more than 100 high school and college students from both sides of the border who spent their summer at UC San Diego in the ENLACE program, building professional and personal connections across the border through science and engineering. 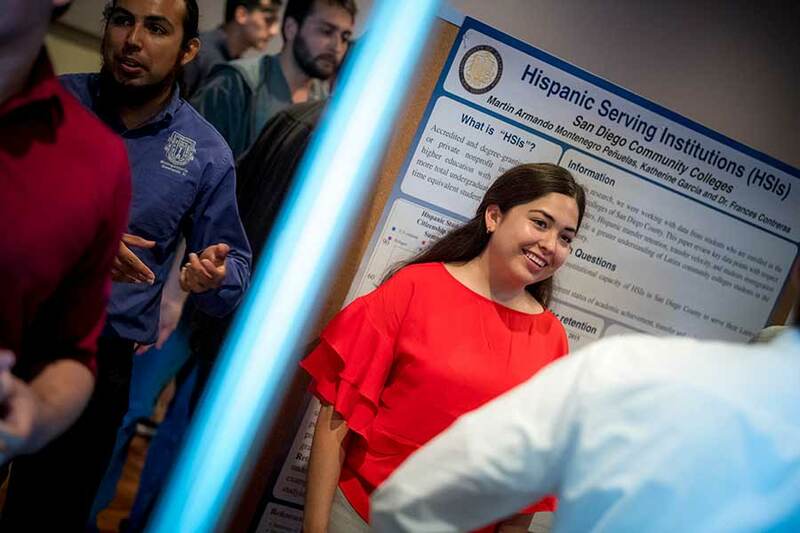 The 108 high school and college students in the ENLACE program this year presented their research in a closing symposium that featured oral and poster presentations. During summer 2018, the students worked in pairs—usually one student from the U.S. and one from Mexico—in 60 labs all across campus, in fields including nanoengineering, physics, marine biology, computer science, psychology, bioengineering, ophthalmology, mechanical engineering and more. In addition to conducting research on pressing scientific questions, they learned how the school systems in the two countries compare; heard from respected community leaders in a weekly Science and Society lecture series; honed their public speaking skills for a final presentation; and bonded over the similarities and differences between their backgrounds. Martinez and Mendez both cross back and forth between the U.S. and Mexico regularly—usually several times a week—to visit family, go shopping or go to the movies. While they knew a lot about both cultures, Martinez said she valued learning how the U.S. education system works, since she would like to pursue a degree in bioengineering or biochemistry here. For other ENLACE participants, like National Autonomous University of Mexico (UNAM) computer engineering student Sebastian Silva, this was the first time they’d been to the U.S. Silva spent the seven weeks of the program in Computer Science and Engineering Professor Tajana Rosing’s lab, working on a machine learning platform to better understand how the brain works and classifies data. In addition to a new experience in the U.S., Silva said he liked that Rosing’s lab itself was very diverse, with members from all around the world. Jessica Garcia, a high school senior from Ensenada, holding a specimen of a ghost crab. She spent her summer in assistant professor Jennifer Taylor’s lab at the Scripps Institution of Oceanography researching how ghost crabs communicate. 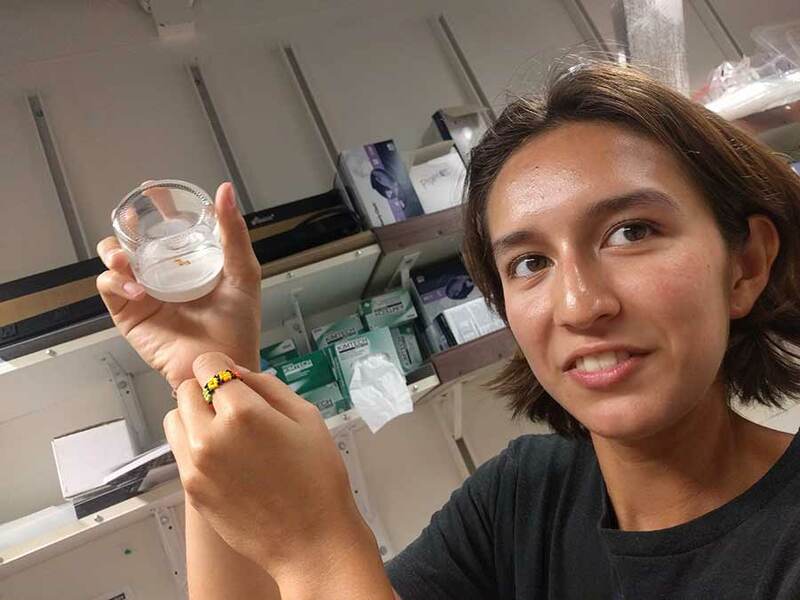 Jessica Garcia, a high school senior at the Center for Technical and Higher Education (CETYS) in Ensenada, was a student in Professor Jennifer Taylor’s lab at the Scripps Institution of Oceanography, studying how ghost crabs communicate. She thought she might want to study marine biology in college, and the ENLACE experience reinforced that, but clarified some misconceptions, too. Graeve grew up in Tijuana and decided in high school to become an engineer while helping refugees from southern Mexico build shelters, dig latrines and create a livable infrastructure. She figured becoming an engineer would give her tools to do this more efficiently. She studied structural engineering at UC San Diego, and even as a student, she thought the bi-national region was missing out on an opportunity. Graeve, who Forbes named one of Mexico’s 100 Most Powerful Women in 2017, has made significant contributions to this end as an expert on nanomaterial development for use in extreme environments. In fact, many students participate in the program because they so respect her. 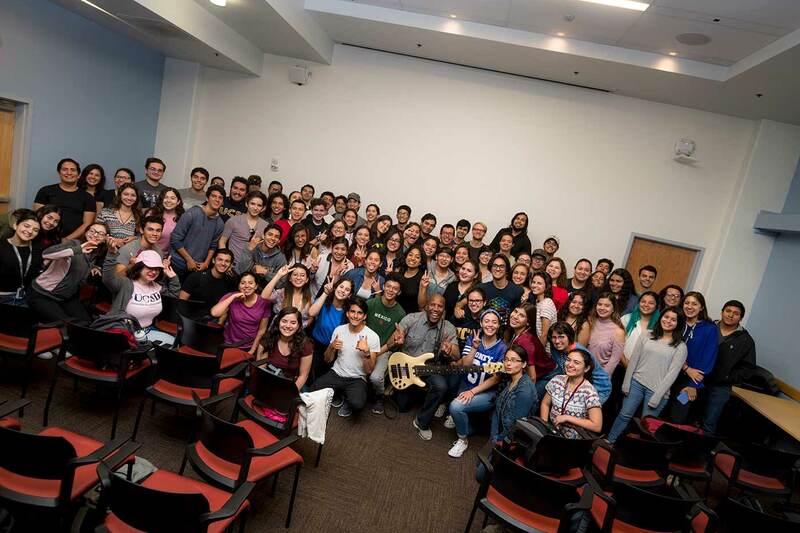 ENLACE students were treated to a jam session with UC San Diego alumnus Nathan East, who’s played the bass for musicians like Beyonce, Eric Clapton and Michael Jackson. East shared his story and advice with the students as part of the Science and Society lecture series. Graeve has also earned the respect of some high-profile people, to the benefit of ENLACE students. Speakers in the Science and Society lecture series included City Attorney Mara Elliot, whose mother immigrated to the U.S from Mexico as a teenager; Judge Gonzalo Curiel, who presided over the Trump University case and the Arellano-Felix cartel case resulting in the first extradition of a Mexican to the U.S. to face criminal charges; and Nathan East, a UC San Diego alumnus and world-renowned bassist who’s played with Eric Clapton, Stevie Wonder, Beyoncé, Daft Punk and Michael Jackson. While peripheral activities of the ENLACE program like these lectures and field trips on the weekends to the San Diego Zoo, beaches and other San Diego landmarks have grown over the past six years, Graeve says the core of the program always has and will be research. Martinez and Mendez are still early in their engineering careers, but perhaps the friendship developed by two ambitious students in the lab this summer as they built batteries will have national and binational effects.